This is a why-to and how-to guide to using Docker in your data science workflow. It is the companion text to the talk I gave at the PyBay Conference in San Francisco on August 18th. Given its length, I have spread this text out over a three-post series. This is the final post. To follow along at home, running code for all the examples is available in a GitHub repository: https://github.com/jfischer/docker-for-data-scientist-examples. We start with a Dockerfile that builds of the tensorflow/tensorflow base image. When running the container, we specify -d for detached mode instead of -it. This will cause the container to run independently of the invoking shell, as a server process. To talk to the container, we will map the network port used by Jupyter, 8888, to the host. We can then connect to the notebook via a browser running on the host. We will start with the tensorflow base image and copy in a Juypter notebook from the current directory. This notebook contains one of the TensorFlow deep learning examples. I have used it as a CPU vs. GPU benchmark in the past. We will copy it to /notebooks, a directory of Jupyter notebooks present in the base image. The ENV PASSWORD test line sets the PASSWORD environment variable to test. This is to provide a default password to Jupyter. It should be fine for your personal machine, but you should try something more secure if you are running on an open port in the cloud. We will see such an example shortly. The CMD directive specifies that we should execute the run_jupyter.sh script (provided by the base image). This script will run until you shut down Jupyter or the container itself. docker build -t pybay-workflow-3a . We are using -d to run in detached mode. The -p 8888:8888 option specifies that we want to map port 8888 in the container to port 8888 on the host. $ docker build -t pybay-workflow-3a . Step 4/5 : WORKDIR "/notebooks"
We can pick our notebook and start running it. echo -n "Please enter a password for Jupyter:"
With this approach, we can even take the password out of the original Dockerfile and just ask the user when starting the container. From this, I can tell that the Jupyter startup script was passed a bad option: --allowroot instead of allow-root. I can fix this and rebuild my container. You do not have to run an interactive shell, you can directly run any executable available in the container. If you are running something interactive (like the shell), be sure to specify the -it options. Perhaps you tried running this TensorFlow notebook on a machine with one or more GPUs. Since TensorFlow supports GPU execution, it should just use the GPU, right? No. It is not quite that simple! Install the Nvidia GPU driver for Linux. You will need the actual proprietary version from Nvidia, the open source ones will not work for this use case. This is only supported on Linux - Nvidia does not support Docker on Mac or Windows. In the example code, workflow-3b adapts workflow 3 to run on a GPU. Although this is a few more steps than running only on the CPU, I have found that it is still much easier than dealing with the GPU library dependencies yourself. In a data science project, one might want to use various analytics tools, including specialized databases, to preprocess our data. It would be helpful to automate the setup of these resources as well. In our last workflow, we will demonstrate the automatic creation, loading, and startup of a Neo4j database using Docker containers. 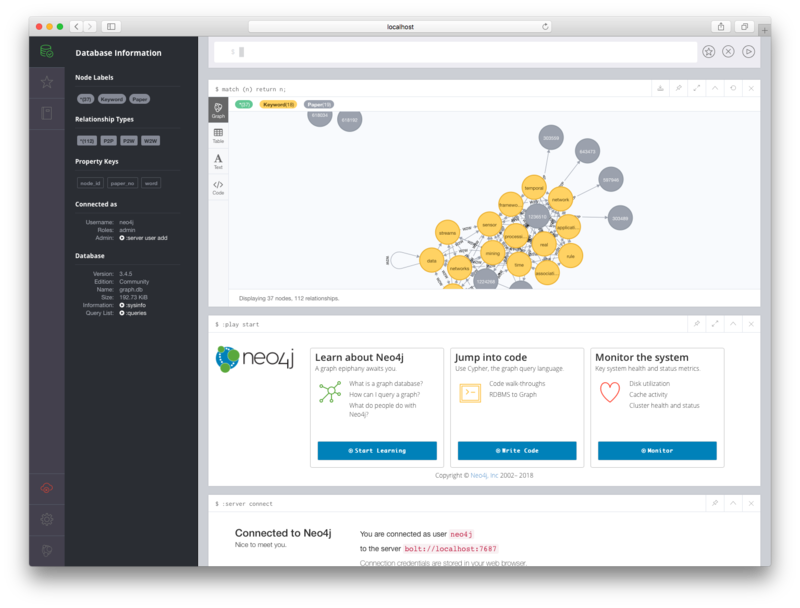 Neo4j is a popular open source database designed specifically for graph data. Similar approaches can be used for other popular databases. We start with the vanilla Neo4j image from Docker Hub - we do not need to create our own unique image for this example. Neo4j's bulk import facility requires that you put your data in a specific format (using CSV), run a the import utility to create the database, and then start the server. If your Neo4j database server has already been started, the import will fail. To handle this, we will create two containers, an ephemeral import container running in interactive mode and a long-lived database server container running in detached mode. Automating this scenario is a little more complex than the previous ones, but still can be done in a 40 line shell script. This script may be found in the Git repo at workflow-4/run.sh. In summary, Docker is a powerful tool that can help automate not just large scale app deployment, but also data science workflows. Container-based automation can eliminate much of the pain in setting up complex data science software. Through Dockerfiles and Docker images, you can reproduce a prior state of your software stack for reproducibility or to share your work with your colleagues. The Docker repository infrastructure and Docker Hub specifically, allow you to build on the work with others without having to figure out the individual installation steps for your dependencies. We have seen these benefits in action with four workflows: running individual Python scripts, running an interactive shell, running compute services like a Jupyter notebook, and running stateful services like a database. We also saw several pitfalls that you should take care to avoid. Hopefully, you can learn from my mistakes! Thank you for taking the time to read this series. If you have any questions, feel free to contact me by email at jeff at this blog's domain or through Twitter at @fischer_jeff. For future content like this, follow me on Twitter or on LinkedIn at https://www.linkedin.com/in/fischerjeff. I hope to hear from you!